Tis The Season of Giving! Join us for 12/3 Opening Knitting to finish your projects! 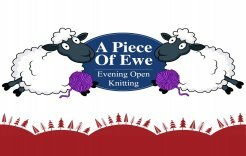 An Update From A Piece Of Ewe! We want to say thank you to everyone for donating to the Bay-Arenac Diaper Bank! We truly appreciate your donations. Our Baby Room is still open! Join us for Open Knitting at the store at 6:30 PM on Monday, December 3rd! We can't wait to see what everyone is working on! Gift Certificates Makes The Perfect Gift For Every Knitter!